Mamoru Oshii is best known here and abroad as an anime auteur whose works, from the seminal dystopian SF “Kokaku Kidotai” (“Ghost in the Shell,” 1995) to the air-action epic “Sky Crawlers” (2008), have often viewed the future of humanity through a glass darkly. In the former film, the citizens of a Hong-Kong-like future city, both human and cyborg, confront malevolent forces in the digital data stream that threaten their very identities. In the latter, elite pilots fight an endless air war cynically designed as lethal mass entertainment by faceless corporate entities. But Oshii has another, more playful side that he has unleashed in two animation omnibuses about grifters who eat and run from fast-food joints, released in 2006 and 2007, and in the live-action shorts he has both made and produced. 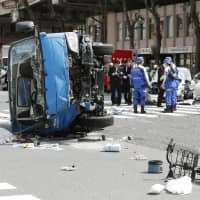 One was his contribution to the 2003 anthology “Five Bullets on Killers,” in which a female assassin with a 50-caliber gun chomps her way through a pile of convenience store food — makers and calories all carefully noted — as she waits for her target. 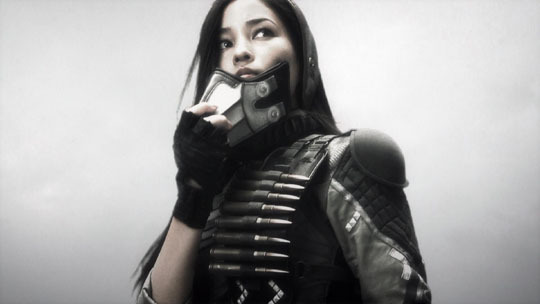 Another was the short Oshii made for the 2008 anthology “Kill.” A sequel to the “Assault Girl” segment for the animation “Shin Onna Tachiguishi Retsuden” (“The Women of Fast Food,” 2007), this plotless short featured two angels (Yoko Fujita and Rinko Kikuchi) who fight a stunningly stylized battle in a gorgeous CG-enhanced wasteland. 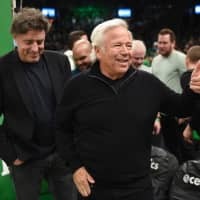 His latest film, “Assault Girls,” however, is staged in the virtual, color-drained world he first conjured for “Avalon” (2001), his first live-action feature, in which gamers (or rather their life-like avatars) fight high-tech battles with deadly real-world consequences. The main characters and their weaponry, meanwhile, derive from the above-mentioned anime and shorts. 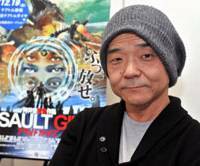 Describing the genesis of “Assault Girls” in a recent interview with The Japan Times, Oshii denied having any master plan. Instead the process of assembling the various bits and pieces into a single film was more accumulative. But it’s not necessary to know any of the antecedents, since all 70 minutes of “Assault Girls” has a simple, stand-alone story of the hot-babes-with-big-guns variety. It’s also another semicomic relaxation from Oshii’s serious anime labors; made more for his core fans than ordinary punters who aren’t in on the joke. 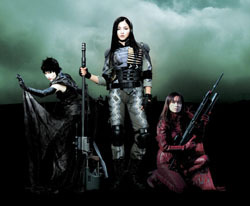 The three title gamers are Gray (Meisa Kuroki), Lucifer (Rinko Kikuchi) and Colonel (Hinako Saeki). They are joined by the one male player, Jager (Yoshikatsu Fujiki), an oafish fellow with a huge gun but limited skills. Their targets are suna kujira (“sand whales”), enormous, multieyed monsters that move through the volcanic ash (of the real-life island Izu Oshima) as easily as whales in water, similar to the sandworms in David Lynch’s SF epic “Dune” (1984). The ultimate goal of the players is to waste the biggest of these creatures, called Madara. When players die a virtual death, they bounce back with their pixels — and neurons — seemingly intact. This makes the player-vs.-monster confrontations feel more like vid-game sessions than genuine battles. Gray, the strongest player of this quartet (and, in her black leathers, the hottest), blasts suna kujira not only on land but also from a sleek one-woman plane that swoops and zooms like Harry Potter’s Quidditch broom. The unseen Game Master (Ian Moore) warns her, however, that she cannot overpower Madara alone — she will have to team up with the others. Gray gets along with the two women well enough, though Lucifer does a coy Charlie Chaplin impersonation while the action rages about her. The crude, sexist Jager is another matter, however. Gray ends up fighting him one-to-one in what is more a gag match than a grudge match, setting the stage for the concluding battle royal. 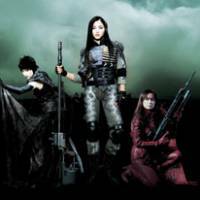 Kuroki, a much-in-demand model/ singer/actress; Kikuchi, an Oscar nominee for her work in “Babel” (2006); and Saeki, who appeared in the first “Assault Girls” segment, are not required to do much more than look tough and cool — and that they do well enough, especially the glinty-eyed Kuroki. Call them hard, eye candy. 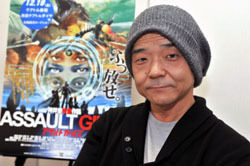 Oshii’s aim in the whole “Assault Girls” process was to make a live-action fantasy of the type he seldom sees in Japanese films. “This sort of fantasy world is often found in Japanese games and anime, but that’s about it,” he says. 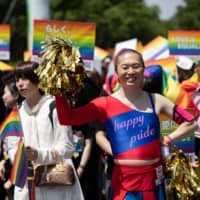 The reason: Hollywood supplies all the live-action fantasy Japanese audiences seem to want or need, with the “Lord of the Rings” and “Harry Potter” films being recent successful examples. 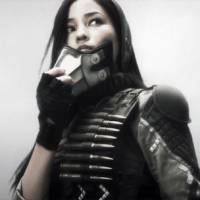 “You can’t make a profit with Japanese actors and actresses in a fantasy film,” Oshii says.